Nearly 25 years of experience. Our staff began creating complex territories for a consumer products company. We developed large maps, as large as 9 by 12 feet, to hold all the data and information needed to support the sales territory management process. Once on the Mainframe, then on the PC and now on the Web, we create and deliver sales territory support. Projects Large and Small, Complex and Basic, we want to work with you...one map or one thousand. Whether you are part of a multinational organization or the proud owner of a small business, we give you best of class expertise and a solution to your territory needs. We Develop the Design Process Right for You, a process that makes sense for you and your organization. We will help you make the right choice between services and systems. And, we grow with you...start by using our service and then, as your organization expands, transition to a system...often the same system we have built to do the work for you. 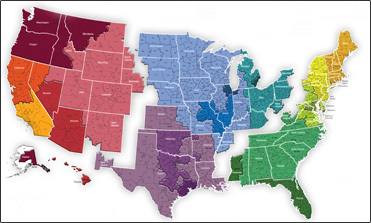 Take advantage of the latest franchise and sales territory tools on the web. Save Time and Money We draw on our experience to help you design the best process for your business. And, our large client base allows us to share the economies and minimize your costs. Projects Completed on Your Schedule When a client asks "When can you complete my project?" we ask "When do you need it?" A fully integrated staff of designers, analysts, developers and map makers work with you to coordinate every aspect of your project. Every effort is made to bring together the resources necessary to get you using your territories. Let Us Invent Your Solution Many of the products and services we now deliver daily were not previously available. As our clients came to us and presented their business needs and challenges, we would work with them to invent a new solution. Today, 25 years later, our clients continue to bring to us their latest requirements, as they face a changing world and an often increasingly competitive environment. Thank you for your support and consideration of SalesTerritory.com.